I knew I’d love Prashad before I had even stepped foot in their restaurant in Drighlinton. I’ve visited their love child, Bundobust, (the other parent being the CAMRA pub The Sparrow in Bradford) on many occasions. It’s fair to say Bundobust is one of my favourite places to go in Leeds’ City Centre. I also own both of the Prashad cook books. D and I love cooking and eating the recipes in these books and have our firm favourites, I’m looking forward to book number three (hint hint). Prashad was formerly in the heart of Bradford, but after the fame of ‘Gordon Ramsay’s Best British Restaurant’ series, they found themselves needing a much larger place to house their new found fan club. Drighlington isn’t the first place you’d think of for a night out, aside from Prashad there doesn’t seem to be much else there, except from a couple of pubs and a main road (that all the boy racers love to drive down with their large exhausts blaring out between Bradford and Leeds). I guess that’s why it’s taken me so long to visit, which is silly really as it’s only 25 minutes in the car from North Leeds. Prashad have gone from strength to strength, clearly evidenced by the release of two cook books, and their joint venture Bundobust has now opened their second place in Manchester. In addition to this, they have also one several AA rosettes and a host of other trophies that I noticed displayed in their restaurant. 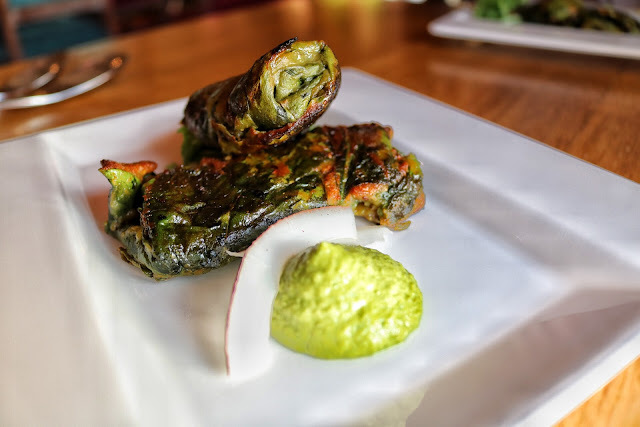 I’ve written so much about Prashad already and I haven't yet told you what they do. They are a vegetarian Indian restaurant. So many will be excited by their vegetarian and vegan offers, but on the same hand so many will be un-enthused by the lack of meat on the menu. If you’re in the latter category I urge you to think again, you will not miss meat at Prashad. Prashad has a regular menu, where you can order starters, desserts, mains, sides etc. and they also have a taster menu. On this visit we ate from the taster menu, something not overly familiar in an Indian restaurant, but I had no doubts that I would love everything that was offered to us. So much so I didn’t even read what we were to have, I had full trust in them and it was a nice surprise at each course! The taster menu is 7 courses at £46 per head, in my opinion, very reasonable in comparison to other tasting menus. If, by the end of this blog post, you decide that you too would like to go for the taster menu, I offer you one piece of advice. Starve yourself all day. I was incredibly full by the end of the meal and really struggled to finish the last two courses, which was very upsetting as everything was so good! Camden Pale no longer Indie but still a good ale in my eyes. The chap and I ordered a pint of Camden Pale each (drinks list based on Bundobust recommendations), because everyone knows that beer pairs best with Indian food. I hadn’t realised it, but I had started to err on the side of ‘hipster beer snob’ as I haven’t drank Camden Pale since they were taken over by a larger brewer and they were no longer seen as ‘independent/craft ale’ by some. I know, I hate myself for this too. It was a ridiculous ideology as when I took my first sip I remembered why I drank it before, because I actually quite like it (although currently my stomach doesn’t and instead punishes me by making me look like I’m 6 month pregnant after a couple of pints) not because it's 'cool' to drink it. Poppadoms with the best ever chutneys. 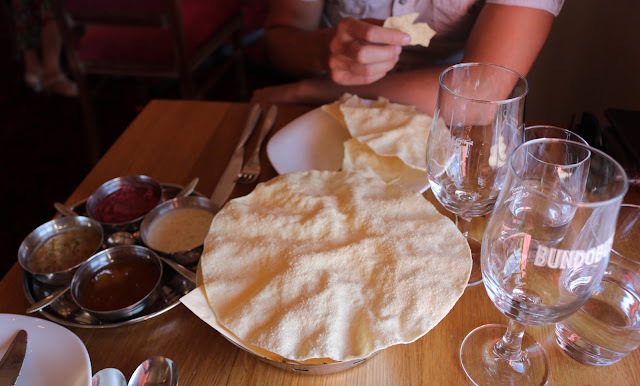 We had some poppadoms to tie us over (when in Rome/Drighlinton). The accompanying chutneys were different to your average curry house, there are old favourites with slight twists in flavour such as mango chutney and the minty herby yoghurt, in addition to these was a spiced rhubarb chutney too. I’d written a little note on my phone with the full details as given by the waiter, however, I carelessly deleted this a day later. As an extra course, we received a small dish complementary from the chef. Once again the details of this dish were on my notes, that have now gone forever from my phone. The first course of our taster menu was a Paneer and Soya Samosa. A samosa like never have I had before, it came open and shaped as a cone. The light pastry wrapped around the diced paneer and provided a slight kick to the taste buds. The second course, Pattra, marinated leaf parcels stuffed with a fine spiced rice. I’ve had similar looking leaf parcels before, usually in Turkish restaurants and have found them too rich, this prior experience had made me a little cautious. I didn’t need to worry however, despite them being filling, the flavours were excellent and I am encouraged to try and replicate something similar at home. The third course, Kopra Pethis, made up of coconut, potato and spice. I've made something similar to this from their first book, except it didn't quite look as good as this and the recipe called for sultanas which I accidentally forgot to add, but it didn't matter as they were good without. These fried potato balls were perfect, nestled in to their own little home on the plate (where do they find such perfect crockery?!) with a flower delicately balanced on top. Perfection. 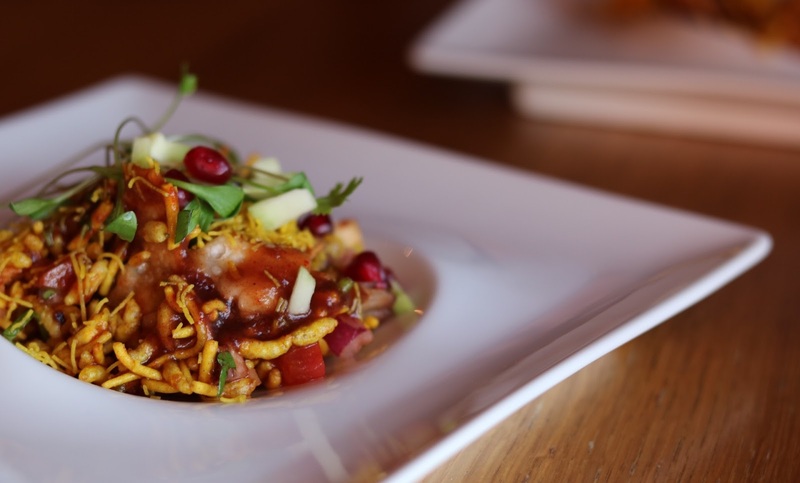 The fourth course, Bhel, consisted of puffed rice and tamarind. I've tasted my Bhel Puri over the years, some of the best Bhel Puri I've tasted can be found in an unassuming restaurant above a parade of shops on Street Lane in Roundhay. The Bhel served to me this night was a little more refined, it had a little more care. The slap dash usually present in this dish was instead a delicate balance of sweet and sour, crispy and soft, dry and juicy. A very well brought together dish. 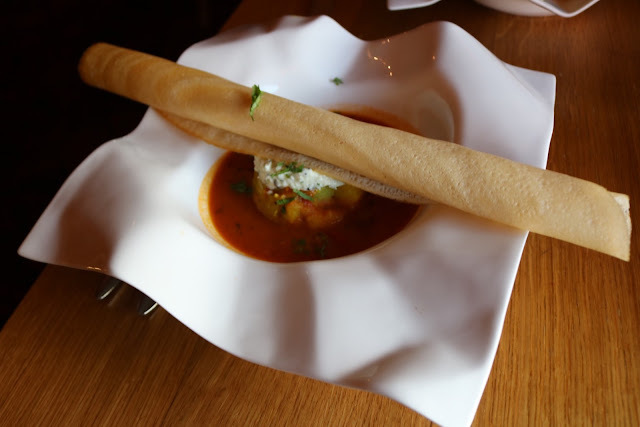 The fifth course, Masala Dosa, is an Indian crepe with potato and onion curry with a lentil broth. Another dish that isn't a stranger on this blog or my Instagram feed. I love a dosa. No, correction. I love a good dosa. I've had dosas that haven't quite reached par, but this one met it by far. I love the way the only sensible way to eat Masala Dosa is to rip up the dosa (Indian Pancake) with your hands, dipping and scooping the broth. 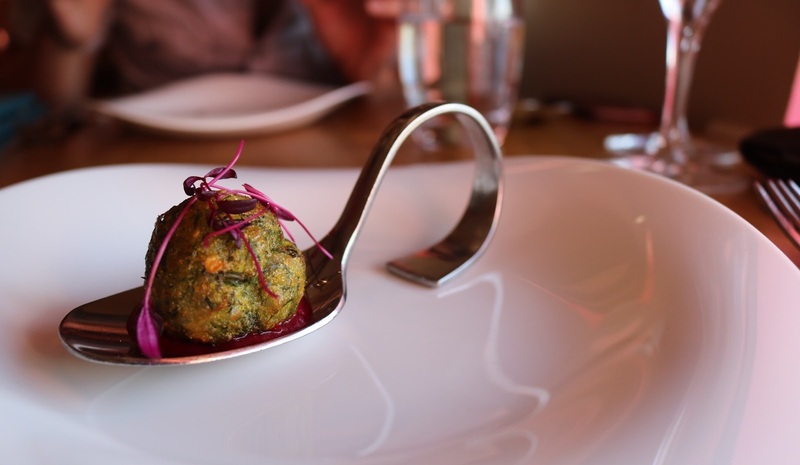 The sixth course, Kofta, was a seasonal vegetable dough ball. Admittedly, I was struggling by this point in the meal, but there was no way I was going to admit defeat yet. The vegetable kofta ball beautifully formed, the curry moat that surrounded the rice was a little spicy but not unmanageable, the naan-like strips were warm and perfect for dipping even if I didn't manage to finish the rice. The final and seventh course, was a Manago, Pistachio, Cardamom Hung Yoghurt. I never normally order dessert in and Indian restaurant, either because there is limited options, poor options or I'm just too full to fit in another bite. If all Indian restaurants served desserts like this however, I would be sure to leave a little room. The service was impeccable, service that wouldn't stand out in a Michelin starred restaurant. The staff were friendly, professional and gracious. I felt incredibly welcome and I could sense that this was being echoed throughout the entire restaurant. I can't wait to go back to Prashad's.